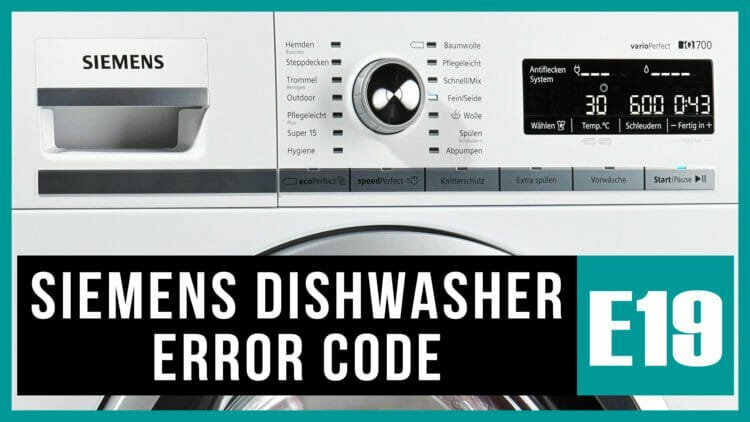 In the majority of cases, the E19 dishwasher code signals about the failure of the heat exchanger recirculation valve. Another name for this part is the drain valve. Having faced with the appearance of this error, start checking the components with this detail. First of all, get it out and change a loop on the part. The heat exchanger is a technology used in Siemens dishwashers. It is located behind the left wall of the chamber for washing dishes. It receives cold water flows during the washing process. When heat exchanges with hot water, the cold water also heats up. Then, the heated to the optimum temperature water enters the dishes between the stages. Due to this technology, thermal shock is excluded and energy consumption is reduced. What if during the inspection you find that a drain valve needs replacement? So, the first step in the list of action is to drain or remove water in any convenient way. It is noteworthy that for a simple dismantling of the heat exchanger, it is not necessary to remove the drain valve. having reached the limit, remove the part from the heat exchanger by pulling it out.